Our free spring papers were beyond cute! 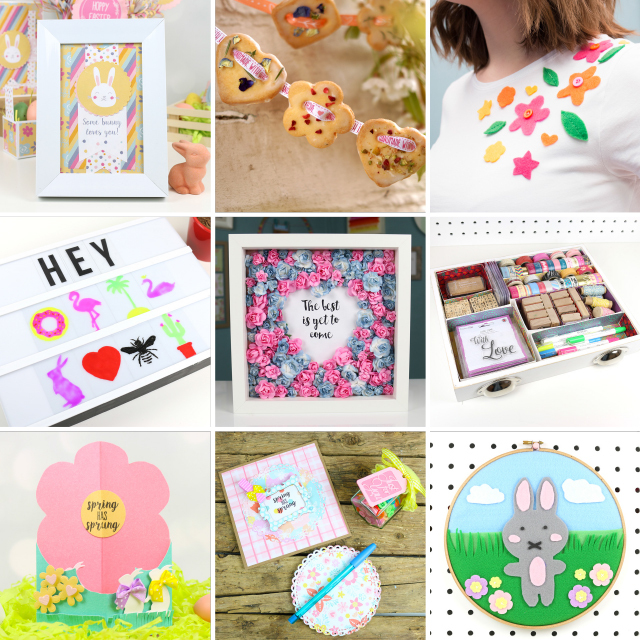 From bunnies to brightly coloured patterns, this collection will be a real treat to use this season. For our baking feature this month, Elle showed you how to take your baking to the next level by creating biscuit bunting! These delightful biscuits taste as good as they look! Want to upcycle an unloved t-shirt? Or add a personal feel to your fashion? Download our free template and get floral with your felt to create a beautiful, springtime statement! Lightboxes are all the rage at the moment so we jumped on the bandwagon and took you step by step to show you how to use our free template to create these funky symbols! That flamingo is a serious must-have! Everyone loves an inspirational quote so we designed two free printables ready for you to adorn with flowers and other pretty embellishments, to create a gorgeous home décor piece! Feel like your drawers in you desk are getting out of hand? Find out how Maxine has organised her stationery with a crafty touch using the First Edition Storyteller papers. Tired of using the same 6x6 card blank? Why not download our free template and learn how to create this stunning flower card shape! Better yet, you can change your embellishments to fit the occasion you’re crafting for. Take your die cutting to the next level as Maxine shows you three unique ways on how to use the First Edition Nesting Doily dies. From notebooks, card to felt lid toppers, this die set will be sure to take you far! How will you use our free craft templates this month? We would love to see so don’t forget to #trimcraft when uploading to social media and to share your makes in the inspiration area! Loved everything from April's crafting ideas but my favourite was the free templates to make a bunny embroidery wall art, however I don't think this will fit into anyone's room I know so I might try to adapt it to make a card. Thankyou #Trimcraft @TheCraftBlog for all the April's freebies and competitions. Very much looking forward to Mays goodies.